Did you know that Fordham IT has undertaken a green initiative? Meiren Park, currently a junior at Fordham, majoring in engineering physics and working as Fordham IT’s Communications Intern, found out more about it during an interview with Roslyn Nedd, Director of Acquisitions, Business Office and User Support, and Luis Santiago, Business Office Team Lead. They are spearheading the Green IT initiative. Meiren Park: Tell me about the green initiative you’ve implemented to encourage Fordham IT staff and others at Fordham to be environmentally friendly. Roslyn Nedd: We’ve introduced many initiatives to help Fordham IT go green. One of the first things we did was eliminate all paper files, which totaled almost 2.2 tons in weight, and then we converted what we needed to retain into a digital file format. We also purchase electronic signature software to allow us to continue the practice of minimizing paper usage. Luis Santiago: Another big change was to stock our pantry with reusable utensils and dish and drink ware. RN: We have also swapped plastic and wooden coffee stirrers for individual spoons which attach to the reusable mugs that we’ve distributed to each staff member. Our K Cup coffee machines were replaced with a fresh bean to cup machine, which eliminates the use of wrappers and the non-biodegradable K Cup. Additionally, we’ve eliminated individually wrapped sweeteners and creamers by introducing an all-in-one dispenser. LS: We also converted all of our disposable batteries to rechargeable ones, and set up a battery recycling bin and a rechargeable station in our Dealy lower level location. RN: We’ve installed several two-in-one — hand purifier, wet wipes, dispensers, which eliminate the use of individual hand purifiers and lysol wipes. MP: Which change has the initiative brought that you are most proudest of? RN: We probably have two different answers! But mine is that we’ve not only eliminated waste, we’ve also cut costs. I love saving money. LS: We definitely cut costs and taught people to become aware of wasteful behaviors. We’ve given them opportunities to change their habits. RN: Changing people’s habits and the way they think was probably the most challenging. But because the initiative has been so successful, it’s something we’re proud of. MP: Why are recycling and environmentally-friendly practices important to you and Fordham IT? RN: We’re all ignorant about something. But when you know better, you do better. When you listen to the news and the reports about waste, you can’t ignore that. As you learn more about consequences, your responsibility for responding grows. It’s my responsibility to share my knowledge and make a change, as big or little as I can. LS: For me, it’s thinking about the environment itself. I have children, so I’m always thinking about their future. Whatever I can do to make sure their future will be a good one is important. MP: What advice do you have for people who want to go green on their own, without any initiatives or programs? RN: I would say to listen, learn, and be honest. If you’re listening to what’s happening to the environment and you want to be honest about it, you have to change your habits. By doing so you will inspire others to do the same. For those who practice sustainable living at home, I would suggest they bring those ideas and practices to the office. Before you know it, you’re making a difference in your workplace. I think every little bit helps. You don’t have to preach about it. When people see you doing the little things, like recycling paper or avoiding plastic utensils, they start to mimic you. You’re actually making a positive change when people watch and then follow your lead. MP: What are some other initiatives around the Fordham IT offices? RN and LS: To encourage people to recycle appropriately, we bought small table top trash bins. Eliminating big bins next to each desk forces people to think about what they’re throwing away. I mean, what do you usually put in your trash bin? Everything. But you shouldn’t. What should go in a trash can are non-recyclables, like Kleenex and candy wrappers. You only need a little trash bin for those things. 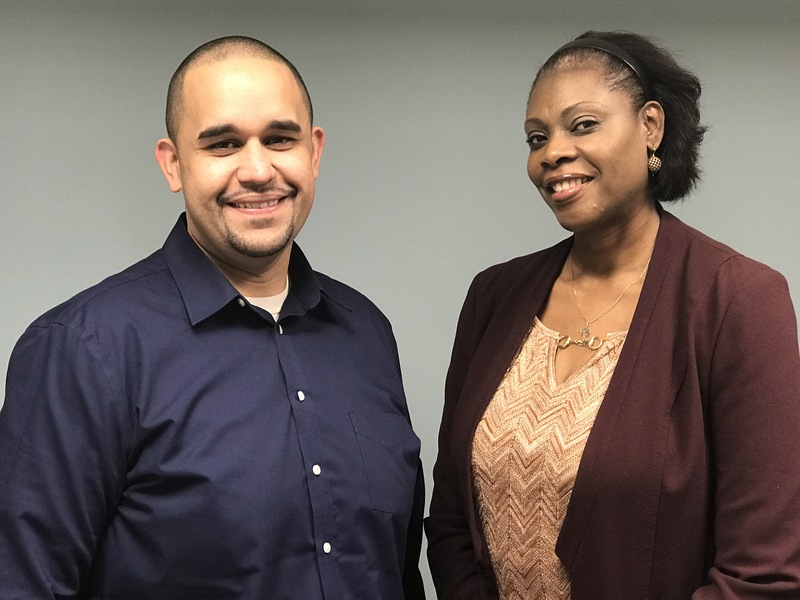 Thank you, Roslyn and Luis, for taking the time to be interviewed. We hope their passion for going green inspires your office to go green, too!